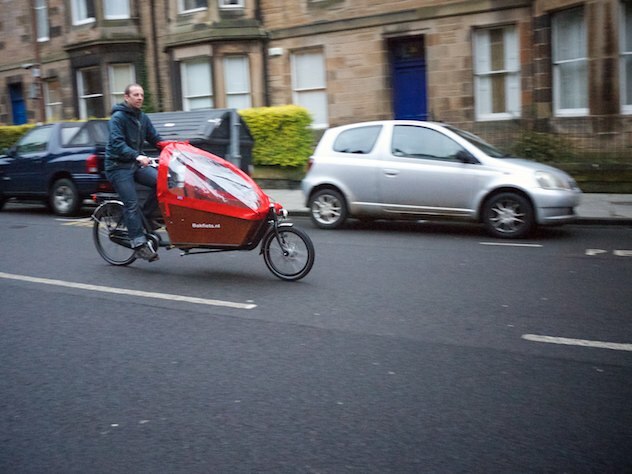 Brought in for a customer to transport their children around Edinburgh in style (and probably the kitchen sink too), I was keen to take a closer look at what is unquestionably a benchmark vehicle. 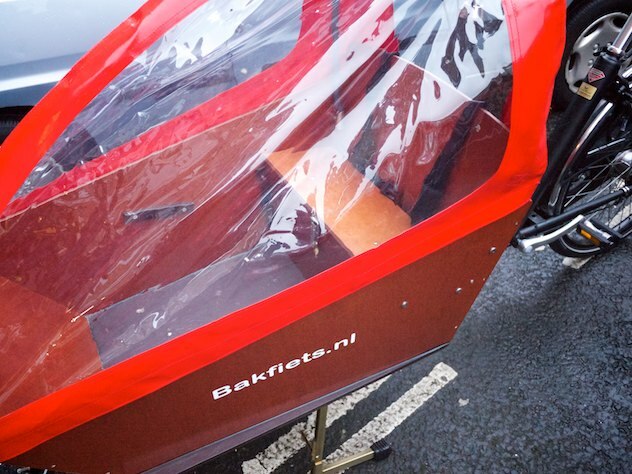 Designed from the ground up to transport as many as three children in comfort and safety, everything about the Bakfiets feels burly and well designed – reassuring when you consider the use and abuse it must withstand. The interior comes equipped with a bench (doubling as a locker) as standard, with the possibility of fitting a further bench in front, a baby or toddler seat, room for your shopping, whatever. You can just see the massive kickstand in the photo above – it keeps the bike completely stable at rest, and even better, you can put it up and down just by kicking it (usually “kick” stand is a misnomer, especially for loaded bikes). The steering is remote via a very heavy duty rod, as you can see below. In use, the bike is really very manouverable, and I was (more or less) able to trackstand it, so while ponderous, it’s much more agile than you’re probably thinking. Just don’t try to lift it up any flights of stairs! A dynamo provides full-time lighting, although bizarrely there is no standlight (a strange omission when this is a negligable part of the price of such an expensive bike). I suppose there’s no question of being missed on the roads, even just with the coachwork! 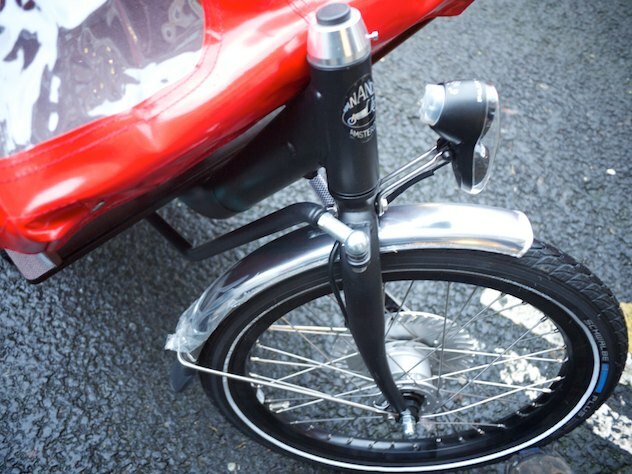 Roller brakes provide stopping power in all weather – in theory. Frankly, I wasn’t overly impressed but it’s quite possible that the brakes need more than a few minutes’ use to bed in (drum brakes improve for the first wee while as the surfaces match up) and this could rapidly be fine. 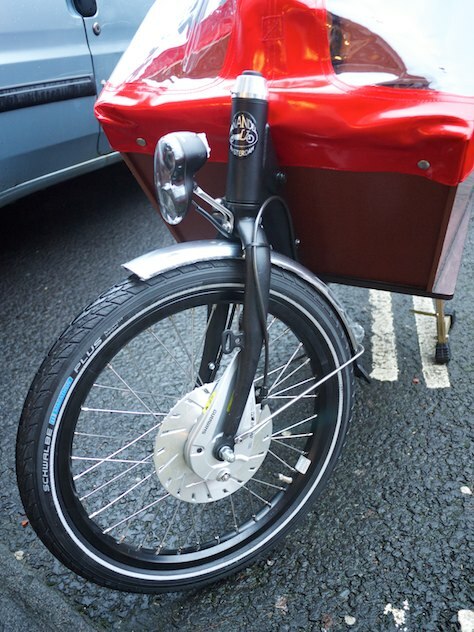 You’d certainly expect any hub brake on a 20″ wheel to be enjoying some serious mechanical advantage. Best of all was the ease of finding a parking space (even easier than with my Carry Freedom Y-Frame trailer). Add in full protection from the elements, great space from passing motorists and awesome crash safety; are you fancying this for the school run yet? 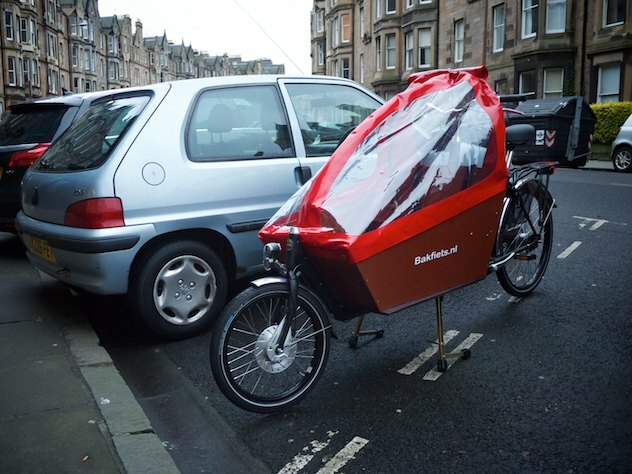 The jury’s out on the practicality of such a bike in Edinburgh, given that you more or less have to store it outside like a motorbike (and, of course, the hills) but I sincerely hope to wangle some more saddle time and bring out a detailed review in due course!